Alaska Christmas Tree Farms: choose-and-cut Christmas trees, Tree lots with pre-cut trees, stands, sleigh rides, hay rides and related winter events and fun! Whether you want to cut your own tree, pick a live tree and have it cut for you, buy a tree already cut or buy a living tree you can plant, this page provides detailed listings of Alaska's choose-and-cut Christmas tree farms, places to buy pre-cut (also called pre-harvested and fresh-cut) trees, stands, sleigh rides, hay rides and related winter events and fun. Some listings are for tree farms, others are tree lots, and some only offer hay rides, sleigh rides or other winter events. READ EACH LISTING to know what each facility offers. The farms are listed further down this page, so scroll down the page! Since this service is free and open to ALL Christmas tree farms, not just those who belong to an association or pay for an ad, like almost all other websites do, this is the most complete and current listing available! I'm always looking for more to add, and to correct any inaccuracies or errors, so if you encounter any, please email me ! And please tell the farmer you visit in Alaska that you found their farm here! I need the farmers to realize that you found them here so that they will keep their information up to date! In 2015, the National Christmas tree, came from Alaska. The 74-foot tree that is the official Christmas tree for the U.S. Capitol grounds came from a national forest in Alaska. The tree is a Lutz Spruce from the Chugach National Forest. This year's tree traveled 4,400 miles to D.C. See more here . Christmas Tree cutting (according to this page) will again be allowed on unrestricted STATE LANDS WITHIN THE MATANUSKA VALLEY MOOSE RANGE as shown on the reverse side map. No permit or fee is required. Christmas Tree cutters should be aware: No roads or parking areas will be maintained for Christmas Tree cutting. Access into most of the area is by snow machine, skis, snowshoes, or foot. Private property exists within the cutting area. Most, but not all, such areas area marked with either "Private Property" or "No Trespassing" signs. Please be sure you are on state land before cutting a tree. Christmas Trees from this area are for personal use only and are not to be sold or bartered. Please don't litter and be courteous to other tree cutters and the citizens who live in the area. Cut trees as low to the ground as possible. Chugach National Forest : all areas are open for Christmas tree cutting except Portage Valley, Turnagain Pass, Moose Pass, and Cooper Landing. Chugach National Forest's Anchorage office: 907-743-9500. NOTE: Christmas Tree cutting is not allowed in Chugach State Park or other park lands. The open area starts at Mile 65.5 after Bertha Creek Campground (just beyond Turnagain Pass rest area). There are private or timber sales lands, so please be sure you are on Forest Service Land before cutting. Only one tree per family is permitted, and topping of trees is prohibited. All tree cutting must be 450 feet from any roads, trails, trailheads, campgrounds, or bodies of water. Stumps must be cut low to the ground and all debris removed from roads and trails. Select trees so that other trees remain within 12 to 15 feet surrounding the one you cut. 1920 W Dimond Blvd, Anchorage, AK 99507. Phone: 218-349-1754. Email: minnesotabobs@yahoo.com. Open: Daily from 9 am to 9 pm starting the Friday after Thanksgiving. Directions: Click here for a map and directions. Payment: Cash, Check, Visa/MasterCard. All of our trees are individually priced according to size, quality and type. Bob Smith's Christmas trees is a tradition in Anchorage Alaska. Begun in 1962 Minnesota Bob's is one of the last remaining outdoor Christmas tree lots in the area and has become a custom for family's keeping the Christmas spirit alive. Bob rooted Christmas tree selling in his family in 1980 when he began his farm in Mora, Minnesota where his wife and three sons helped run the farm. Now, over 30 years later, you'll still find his son David hard at work on the family business. PreCut varieties: Balsam Fir, Canaan Fir, Colorado Blue Spruce, Fraser Fir, Scotch Pine, White Pine, White Spruce. University Center Parking Lot, Anchorage, AK 99507. Phone: 907-315-2435. Email: northernpacificenterprises@yahoo.com. Open: Monday thru Sunday, from 11 am to 8 pm from Friday after Thanksgiving, December 20th. Directions: university mall parking lot in anchorage and across from the mug shot bar in Wasilla. Payment: Cash, only. 10899 Bells Flats Road, Kodiak, AK 99615. Phone: 907-539-2338. Email: tncdorman@gci.net. Open: Friday Saturday and Sunday from 10:30 am to 5:00 pm, November 23 to December 23 . Directions: From Kodiak City. Take Rezanoff Drive south about 10 miles, to the Bells Flats community. Turn right on Sargent Creek Road, Take first left on Bells Flats Road.The farm is located 1/4 mile down Bells Flats Road on the left. Click here for a map and directions. Payment: Cash, Check. You-Choose and You-Cut varieties: Canaan Fir, Colorado Blue Spruce, Fraser Fir, Grand Fir, Norway Spruce, White Fir (Concolor Fir), White Spruce. You Choose and We cut varieties: Canaan Fir, Colorado Blue Spruce, White Fir (Concolor Fir), Fraser Fir, Lodgepole Pine, Noble Fir, Norway Spruce, White Spruce. 111 Bartel Ave, Kodiak, AK 99615. Open: starting on Friday, December 1st , open on the weekends leading up to Christmas. . Directions: the World Wide Movers Building. Come get your trees! We're excited to share the Christmas Spirit with all of Kodiak. 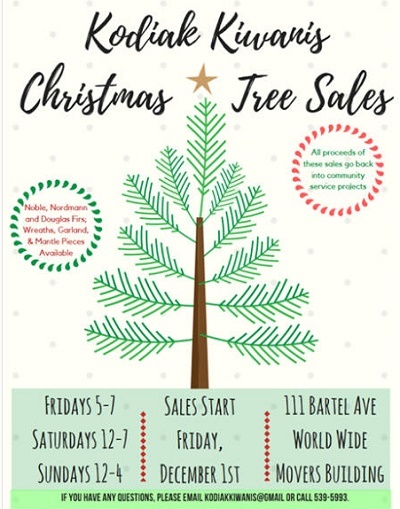 All procceeds from tree sales go back into the community through community service projects and all of the proceeds from wreath sales go go benefit the Kodiak High School Key Club. See you on December 1st! !